*Dehydrator Cookbook: Ultimate Guide to Drying Food with Dozens of Dehydrator Recipes for Jerky, Snacks, Fruit Leather, and Just-Add-Water Meals by Crystal Jennings. Price: Free. Genre: Crafts, Hobbies & Home, Gardening & Horticulture, Regional, Midwest. Rated: 4.5 stars on 11 Reviews. 110 pages. ASIN: B079T3KB73. Growing Calendar 2017: Remember When To Plant Your Vegetables, Fruits And Herbs : (Gardening Indoors, Gardening Vegetables, Gardening Books, Gardening Year Round) by Rita Abbot. Price: Free. Genre: Crafts, Hobbies & Home, Gardening & Horticulture, Vegetable. Rated: 4.3 stars on 5 Reviews. 27 pages. ASIN: B06X1BC9QB. Posted on March 4, 2018 Author KibetCategories Crafts, Free Kindle Gardening Books, Horticulture, indoor gardening, VegetablesLeave a comment on Kindle Gardening Deals for Saturday! 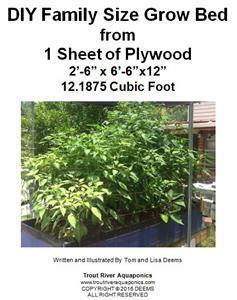 *DIY Family Size Grow Bed (Deal, Not Free) by Tom & Lisa Deems. Price is: $6.95. Genres are: DIY Book Deal, Sponsor, Gardening, Aquaponics. *Preparedness Gardening: Develop a Self-Reliant Gardening System (Preparedness Gardening, Doomsday Prep, elf sufficient gardening, gardening, gardening system, disaster prep Book 1). by Alex Allen. Price: Free. Genre: Crafts, Hobbies & Home, Gardening & Landscape Design, Vegetables. Rated: 5 stars on 6 Reviews. 41 pages. ASIN: B06XHVGBNK. *Weed: The Ultimate Quick Guide To Growing Great Marijuana (How To Grow Your Own Weed, Growing Marijuana for Beginners, Big Buds, High Yields, Growing Marijuana Indoors, Weed Growing Book 1). by Jordan Belfort. Price: Free. Genre: Crafts, Hobbies & Home, Gardening & Horticulture, House Plants. Rated: 5 stars on 6 Reviews. 33 pages. ASIN: B01NC1YANU. Posted on March 21, 2017 Author KibetCategories Aquaponic, Crafts, Horticulture, indoor gardening, plants, VegetablesLeave a comment on Kindle Gardening Deals for Monday! Cannabis: Marijuana Horticulture – How to Easily Grow Cannabis Indoors, Get Higher Yields, & Bigger Buds (Indoor Marijuana & Cannabis Cultivation, Growing Marijuana, Growing Cannabis) by Damien Miller. Price: Free. Genre: Crafts, Hobbies & Home, Gardening & Horticulture, House Plants. Rated: 4.3 stars on 13 Reviews. 57 Pages. ASIN: B01LFYWIS6. Posted on February 1, 2017 Author KibetCategories Crafts, Free Kindle Gardening Books, Horticulture, indoor gardening, plantsLeave a comment on Kindle Gardening Deals for Wednesday!